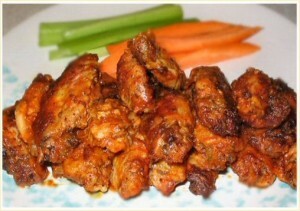 Buffalo Wings recipe by Hina Sajid at DesiRecipes.com. All purpose flour 1 cup. Coat this flour to chicken wings. Then deep fry until brown. On the other hand mix oil and hot sauce. After frying the chicken , toss this chicken into the mixture of hot sauce and oil. Spicy and tasty wings r ready to serve. Serve hot with any salad of your choice.Enjoy!! !